Participants in the recent KYLA event included (from left) Back row: Chris Francis, KCSO POI; Nick Bazzoni, Warsaw Community High School; Abigail Seese, WCHS; Dan Hampton, Kosciusko County Prosecutor; Michael Hammer, Wawasee; Shane Bucher, detective sgt. KCSO. Front Row: Andreana Heiman, WCHS; Addison Marshall, WCHS; Olivia Renier, WCHS; Dayne Koontz, WCHS; Katherine Ousley, Whitko High School. WARSAW — Kosciusko Youth Leadership Academy students recently had the unique opportunity to learn more about the county’s judicial and criminal justice system from professionals of both the court and law enforcement fields. 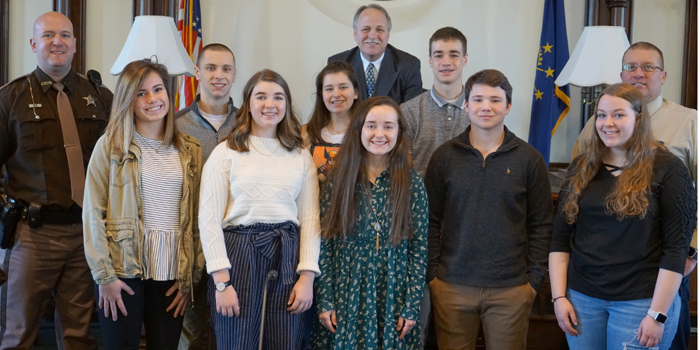 Students met at the Kosciusko County Courthouse and were welcomed by Superior Court 1 Judge David Cates, who commenced his term on Jan. 1, 2015, and shared with students the inner workings of the court system and how the county’s judicial system is structured. In addition to hearing from Cates, students learned about the community corrections program from Anna Bailey, director of community corrections, according to a news release from the group. Bailey was joined by administrative assistant Taylor Pagan to demonstrate the technology and equipment used in the programs involving house arrest and rehabilitation programs. Bailey noted the department works closely with both law enforcement and local service agencies such as the Bowen Center, Serenity House, McArthur Counseling Center and the Kosciusko County Probation Office. Students also learned about the judicial process from Kosciusko County Prosecutor Dan Hampton. Hampton shared how his role works alongside local law enforcement and court systems and how his role doubles as the chief police officer of Kosciusko County. According to Hampton, his work spans a wide variety of issues, and a key component of his job is providing legal advice to police. He also explained his role in local rehabilitation efforts such as drug court as well as his work with child support cases throughout the county. Hampton shared real experiences and anecdotes with students about the challenges and rewards of working in the law enforcement field alongside Kosciusko County Sheriff’s Office Public Information Officer Chris Francis. Following the guest lectures, students were given a tour of the underground tunnel system connecting the courthouses and justice building as well as areas of the jail, courtrooms, offices and 911 call center.